I often don't display signs of desperation when penning my articles on this website but this time I may have to make an exception. The Fractal Design Meshify C Tempered Glass case is making me conjure up feelings of admiration to the point of me wanting to drop the credit card digits and make a purchase. Fractal Design PC cases needs no intro, they by far they make some of best PC cases around. It have standout design, infinite amount of room inside and cable management capability. The case definitely meets my overall standard. Lets explore this PC case in depth, shall we. The design, especially the frontal portion is pretty interesting, its completely covered in mesh, having an indented asymmetrical pattern from top to bottom, which should prove beneficial as the interior will definitely be bombarded with continuous airflow that will ensure any incoming hardware won't succumb to any overheating issues. Though compact, the Meshify C PC case is spacious enough inside to support seven fan mounts and capable of supporting multi-raditors. Speaking of which, while we're on the topic fans and cooling, this case comes pre-installed with two Fractal Design Dynamic X2 GP-12 120mm fans which according to Fractal is suppose to deliver maximize airflow with minimal noise. In looking at the cases interior in depth, there's absolutely no obstructed path from the front intake to rear exhaust. If you have cable management in mind then the Meshify C PC case is definitely ideal for system builders. Behind the motherboard plate there's up to 35mm (1.4-inches) of space with a grommeted pass-through for a nice clean cable routing. You can also conceal any excess cabling in the power supply shroud for added clean interior. If you have followed my posts in the past, I always bring up that one standout feature on a device that gives it the main selling point. With the Meshify C, the selling point is the design. Aside from having a beautifully compact build and stealth black color scheme, for me its the tinted tempered glass side panel the main selling point. I know it's a rather mundane especially with the bevy of impressive features present on this PC case. But the idea of having a full viewing access to the PC cases interior is rather appealing. I mean you literally can see every working component within the case. The Meshify C other noted features are the easy-to clean filters that's placed in the front, top and the base that have a full PSU coverage. Then there's the drive cages which have a flexible storage options with room for up to five drives. These steel drive cages are implemented with vibration dampening rubber grommets which should cushion against sudden movements. Also the audio jacks, power and reset buttons and USB ports are situated on the top-front of the case making it easily accessible. In my opinion this type of setup should be standard on all PC cases. So as you can see, this PC case is loaded in terms of it having a good number of standout features. But none of these features I would say is revolutionary or innovative as most PC cases on the market that fall in the unique category have cable management capabilities, roomy interior and a nicely compact design and yes, that tempered glass. 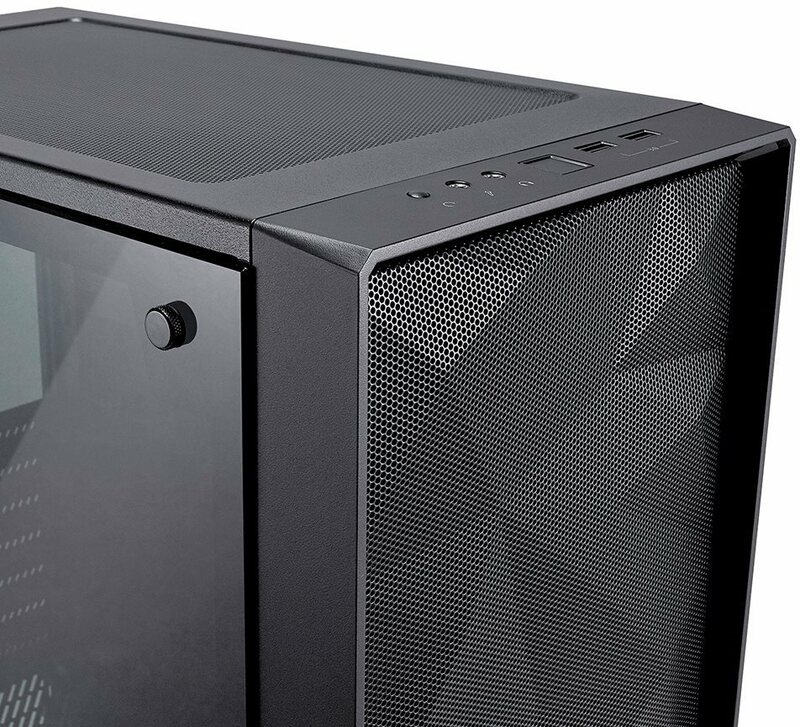 The Meshify C PC case is worthy of a purchase mainly because it have a defining look that's appealing to the visuals and potentially offering unparalleled cooling. Meshify C PC retail for just $89.99 on Newegg.com. When I do gain access to this case, there will of course be a review within the near future, stay tune.